Suave Skin Solutions Advanced Therapy Body Lotion REVIEW&GIVEAWAY! 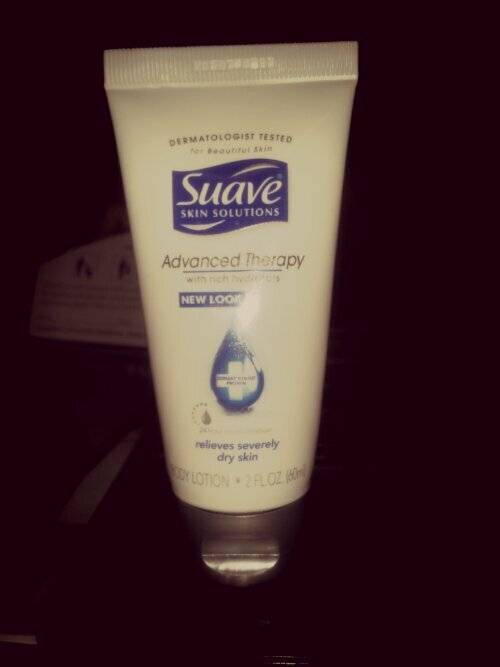 Suave Skin Solutions Advanced Therapy Body Lotion! this is my go to product for dry skin and for moisturizing. I carry one around in my belongings every where I go. I have very sensitive and dry skin, well mostly my hands. I get severely dry skin after using any types of soaps. Like after washing dishes, showering, etc. but it provides instant relief. it smells wonderful and it works! Plus it only costs $1 (for the small travel bottles) so of you’re looking for an affordable lotion for carrying around for your dry skin…then you MUST buy this! I’m serious. It leaves you skin smoother and hydrated. It immediately relieves your unwanted dry skin. I’m going to be giving away four(4) of these lotions! This giveaway will be hosted and sponsored by me eyefeelprettyco. Keep your eye out for my giveaway post! Follow me on Twitter @eyefeelprettyco for updates!